" We can´t tear our lives up and start all over again. You´ve done your share." "Sugar, if we all took root and squatted there´d never be a new country." All I love about Irene Dunne as an actress is already obvious in "Cimarron" but it´s still "Dunne in the making". Regarding her performance the outstanding part is her handling of the aging process of Sabra, mainly through the subtle use of her speaking voice in a range from the high pitched voice of young Sabra to the slightly quivering voice of an old woman. From the very beginning she positions the asset of her instrumental use of her voice,but the other fortes of her signature minimalist acting style are still in the background. Epos is written all over "Cimarron", starting with its sheer duration of about two hours - outstanding in 1931 - the 40 years its story covers - from 1889 till 1929 - and the topics it is aiming at. We follow a young couple, Sabra (Irene) and Yancey (Richard Dix) from Wichita to the newly founded Osage in Oklahoma where he plans to start a newspaper and in general to become part of the conquest of the Southwest. The very first minutes of the film - wonderfully filmed mass scenes of a land race - establish Yancey´s character as an adventurer and free spirited personality with natural authority and Sabra´s character through the simple fact that she is absent, though there are women around. As to be expected Yancey and Sabra have to face all kind of troubles: shootings, forays and difficult life circumstances to start with - Sabra is definitely used to something more noble. As soon as the couple gets more established - wallpapers for the den, a women´s club for Sabra and the newspaper is doing nicely too - Yancey throws himself in the next adventure: the opening of the Cherokee strip, thus leaving Sabra and the kids alone. As Yancey stands for adventure, progress and development, Sabra stands for duration, establishment and steadiness - and one needs the other. There is no doubt that those two human beings love each other deeply but as Yancey isn´t made for staying longer in one place, Sabra isn´t made for packing up her things every five years. As it needs pioneers to start something new on the one side, it needs people in the background to actually build things on the other side. 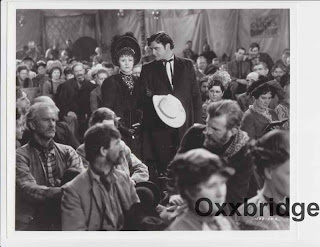 The fact that the absence of Yancey gives Sabra room for an exciting development and that she ends as a successful congress woman in opposite to "Old Yance" working on a oil field, sheds some interesting light on the characters and the principles of moving and staying. Looking at those aforementioned first scenes of the film it´s no wonder it won an Oscar for best picture and was the first Western to do so. In 1931 it must have been overwhelming on the big screen and decades later it´s still striking though we are simply spoiled technically. A real asset of the film is its creating of an atmosphere - especially the buzzing of the growing Osage - and the lovely treatment of details - all different kinds of representatives of mankind crowd the screen. 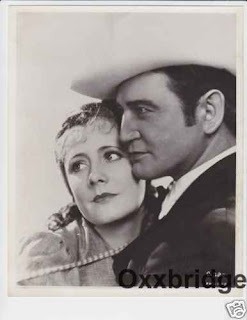 But nevertheless "Cimarron" looks dated which is maínly due to the performance of its leading man Richard Dix who was a star in the silent era and though blessed with a distinguished voice acts with "silents obliged", exaggerated gestures. How different the reception of his acting style was for his contemporaries shows his winning of an Oscar nomination. 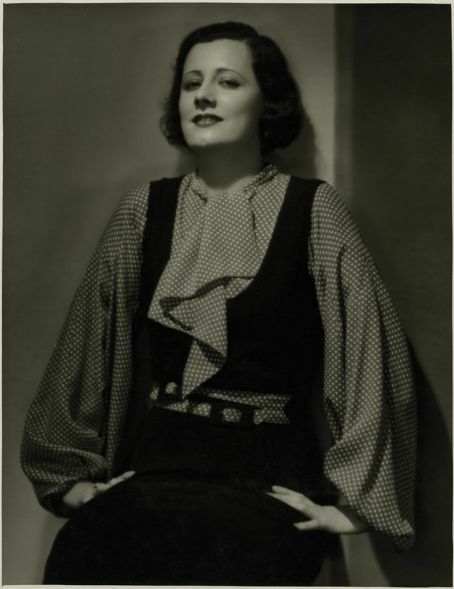 Well, Irene earned an Oscar nomination for it too - the first of a total of five - and this film, only her second, definitely put her on the map as a film actress and openend doors for her as a dramatic performer in spite of her theatre beginnings on the musical stage. For a long time "Cimarron" was Irene´s favorite film, after rewatching it in the 70s she found it "awfully hammy", which I have to admit it is, but nonetheless an early attempt of scoring liberal points through a Western and last not least an entertaining film. I really liked CIMARRON and it's true what you mention about her voice, it changed a lot during the film!! Irene was so great, everybody could've sworn that she was 60 during the last scenes!! She's so amazing, she should've won that Oscar!!!! Detour - Why in chronological order?